Diego Rodriguez de Silva y Velázquez was born to middle class parents in Seville, Spain. Although they were not rich, Diego's parents believed that his education was of great importance and they would sacrifice many things to give him a well rounded education. He studied Latin and philosophy, but soon began painting under Francisco Herrera the Elder. Although Herrera was an excellent teacher, Velázquez soon began going to the studio of Francisco Pacheco. Pacheco was not only an artist, but he also worked as a religious art inspector who had unquestioned authority over artists in and around Seville, one of Spain’s largest cities. Velázquez studied under Pacheco for a nine month trial period, and at the age of twelve, committed himself to a five year apprenticeship. During this time, Velázquez was supplied with a bed, food, and an exposure to painting that would shape his abilities for the rest of his life. On April 23 of 1618, Velázquez married his teacher's daughter, Juana, when he was only eighteen years-old. Eventually, the couple would have two daughters, however, one passed away in her childhood. It was at the time of their marriage that he was able to practice as a painting master in Seville. As Velázquez’s style developed, he very much became a Rubenist. This is one who follows in the artistic footsteps and is an admirer of Peter Paul Rubens. Of the 130 paintings attributed to him, 96 are portraites. Not only was he a follower, but the two were also friends and Velázquez sought his advice several times. Beyond that, his art was also influenced by the paintings created by Titian and Michelangelo Caravaggio. As the greatest follower of Caravaggio, Velázquez incorporated his techniques of adding light and shadow to add drama to his painting known as chiaroscuro. Rubens, Titian and Caravaggio all are known for painting people as the major subject matter in their artwork. They painted the rich, the poor, groups, and themselves. It is easy to assume that Velázquez also followed in this tradition. There are so many great works that Velázquez created over his lifetime. The Prado Museum in Madrid, Spain houses about fifty paintings created by Velázquez: so if you love Velázquez you need to visit the Prado. A great example of his early work is The Adoration of the Magi. It was originally created for a Jesuit novitiate of San Luis in Seville. The chiaroscuro and the rendering of each object is exceptional in this work. The details could be exceptional because it may have also been a family portrait. Being a young up and comer, he may not have had the expendable income to hire models. Using his family could also have been a conscious choice. Whatever the reasons, it is believed that the young king in the front is a self portrait, his wife was used as Mary, his daughter is Jesus, and his father-in-law and teacher Pacheco was the king with the grey beard. As time passed, his working subject matter would shift from religious to royal. Because of this shift, he would create less religious works than any other Spanish artist of this period. 1619. Oil on Cancas. 6 feet 8 in. X 4 feet 2 in. Museo del Prado, Madrid, Spain. Another great example of Velázquez’s work, in the area of portrait art, is Juan de Pareja. This portrait was painted from a live sitting as he was preparing for a portrait of the Pope. Pareja was one of Velázquez’s assistants and an accomplished painter himself, having studied painting in Seville. The work was displayed at the Pantheon and this work alone earned him an election into the Roman Academy. With the completed painting in hand, Pareja was given the task of taking Velázquez’s painting of him around as a traveling art exhibit to show off his master’s skills. This work gained a lot of press in 1971, when the Metropolitan Museum of Art bought this work for a record setting 5.5 million dollars. 1656. Oil on Cancas. 10 feet 4 in. X 9 feet. Metropolitan Museum of Art, NY, USA. At the young ago of sixteen years, Philip IV, became the King of Spain in 1621. Conde-Duque de Olivares, a Chief Minister of the King and the would be Prime Minister, was very knowledgeable about art and Velázquez’s work. The following year, during Velázquez’s first visit to Madrid, he was invited to El Escorial, a residence of the king. Philip IV must have been impressed. The following spring Velázquez returned to paint portraits, including his first of King Philip IV of Spain. He was officially hired as an employee of the king on October 6, 1623. Velázquez, recognized as a genius, moved his family to Madrid where he was paid a salary plus a bonus for each work he created. Philip IV is remembered as a great leader who helped Spain advance in the areas of art, literature, and science. The relationship between the king and artist grew out of the lessons Velázquez learned from Titian. When working with royalty, make the best of their features while minimizing their flaws. Also, because the king wanted to help Velázquez develop into the world’s greatest artist, the king, at the encouragement of Rubens, sent him on several trips to Italy to improve his skills. Being the perfectionist he was, Velázquez was excited to have the opportunity to improve. On these trips he also bought works for the king's royal art collection. Velázquez had several assistants to aid his work. Ironically, he actually created a small number of works over his career, having painted only about one hundred twenty works. As an official of the Spanish Royal Court, Velázquez first travels to Rome, Italy in August 1629. This trip lasted about a year, where he stayed at the Vatican Palace until 1631. His return to Spain was soon met with the marriage of his daughter Francisca to Juan Bautista Martínez del Mazo, who became Velázquez’s disciple and chief assistant. This job would change as Velázquez’s job assignments changed. In previous years he also worked as bailiff to the royal house and court, and wardrobe adjutant. The king would name him Assistant to the Superintendent of Works, where he was given the job of remodeling the Royal Alcázar of Madrid, or the Antiguo Alcázar. This fortified castle was built in 1537, but the exterior and royal living quarters need updating. As can happen, all of the work on this building done by Velázquez was destroyed in a 1734 fire, and a new palace was built in its place. But nothing could replace the collection of over 500 paintings that were destroyed. 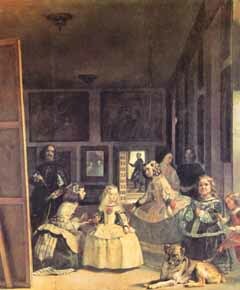 One of the salvaged works from that fire was Velázquez’s most known and recognized work: Las Meninas or The Maids of Honor (first titled Picture of the Royal Family). This work, centering on the theme of Princess Margarita and her playmates, commissioned after her designation as the next heir to the Spanish throne by her father, King Phillip IV. The work strongly revolves around light. For the fifty-seven year old Velázquez, the light made the color, this is why there are so many types of light in his works. It is said that it was painted in an alla prima technique and without any preliminary sketches. This work also has a striking composition that is set in a room that uses one-point perspective. The bulk of the left side is dominated by Velázquez’s self portrait. He was not the first artist to immortalize himself as a major character in a work of art. He was influenced by Phidias and Titian who both did similar effects in their art. By association, the artist is historically as exalted as the royal figures. Velázquez has a key to the royal chamber painted in his belt and the Cross of the Order of Santiago placed on his shirt to show his high position in the court. He was given the title of Knight of the Order of Santiago on November 27, 1659, three years after painting the work. Velázquez was obsessed with his positioning in the royal court. This may be due to his numerous royal court duties. He wore high collar ruffles (called a golilla) to breakfast, enjoyed public floggings, and took park in many other perks. As one looks at the painting, in the front right we see a large Spanish Mastiff, with a male dwarf, Nicolasico Pertusato, resting his foot lightly on his back. Beside him is a female dwarf, Mari Bárbola. After his return from Italy, Velázquez would paint many of these so called "people of pleasure" that provided entertainment to the royals. They became his favorite subjects to paint. They also serve as allegorical pieces to the story. Most works like this one without a symbol fused into its content is very rare. Near the center of the floor is Princess Margarita, with light casting down on her blonde hair and silk dress. At her right is a kneeling personal assistant to the queen, María Agustina Sarmiento, who is offering a drink on a tray. A second young girl is on the princesses left is Isabel de Velasco. Behind this girl and the dwarf is an older nun. She is, Marcela de Ulloa, the Lady of Honor, and there is a man who she is having a conversation with. In the back of the room is José Nieto, the Palace Marshall to the Queen, who is in a doorway beginning to walk up some stairs. On the back wall, the King Philip and Queen Mariana can be seen stepping into the room through the mirror, so we are actually seeing this painting through the perspective of the king and queen's eyes. Allowing this perspective shows the king's respect for Velázquez and artists as professionals. The mirror is a highly noted source of truth (mirrors never lie). The mirror itself is also symbol of the sence of sight and the visual arts. The mirror on the wall is accompanied by two large paintings. Both were painted by Rubens; Minerva Punishing Arachne and Apollo's Victory over Marsyas. They are both symbols of Devine sources of artistic expression. The painting was executed in Velázquez’s workshop in the Royal Palace and is a lasting example of his total command of painting technique and his genius in representing life and atmosphere to compose a complete visual experience. 1656. Oil on Cancas. 10 feet 4 in. X 9 feet. Museo del Prado, Madrid, Spain. Eighteen years after his first visit to Italy, Velázquez was sent back on royal business. Traveling out of Malaga, he reached Italy in March of 1649. His task was to buy paintings and sculptures, as well as hire fresco painters to paint the inside of the Royal Alcázar. He stayed in Rome for a year and five months. It was during this time he painted the portrait of Pope Innocent X. The work was greatly influenced by El Greco’s portrait of Cardinal Fernando Niño de Guevara. It is said that when the Pope first saw the work, he exclaimed, "It is too real!" This is an example of Velázquez using color to create form. Lines between the Pope and his throne-like chair, or the chair and the curtain, do not exist. The colors make the edges appear. This is the last painting Velázquez ever signed. 1650. Oil on Cancas. 4 1/2 feet X 3 feet 9 in. Galleria Doria-Pamphili, Rome, Italy. Velázquez returned home to Spain after the three month journey in June of 1651, even though the king asked him to come back in February of 1650. Despite the disregard for the king’s request, Philip IV saw Velázquez as a calm and slow worker, so he cut him a lot of slack. At this time he was given a raise and appointed Chamberlain of the Palace of the King. It was not only his artistic skills, but also his character and abilities at managing court business that greatly appealed to Philip IV. The award of being named Chamberlain was also a punishment, in that this honor took a lot of time away from his art. In the summer of 1660, Velázquez was traveling with the king in France. It was warm in June and he was tried from his work and the road. On July 31, feeling feverish, he would return home to Spain, where the royal doctors said he was in critical condition. Days later Velázquez died of a severe fever. He has been called (by Salvador Dalí, Pablo Picasso, and many others) the greatest Spanish artist ever.